From last Tuesday, we know that we don’t still have a “Brexit deal” with European Union. What does it mean is that if the UK Parliament cannot reach a deal, the UK will be out of the UE from 29th March. There is a lot of affected areas (especially economy and citizens), but here we would like to expose or analyse what would mean a “no deal Brexit” for British citizens currently working and living in Spain (or another EU membership). A good example are the British football players. First of all, I think we need to wait until March to see what might happen. In the case that the Brexit comes to effect, the UK will have 2 more years of transition while they need to introduce laws so as to standardize the new legal framework. In the meantime, we can talk about hypothetic cases. Up until today, to handle the football law, we need to separate the different institutions and leagues. For example, I don’t see much of a problem with regards to competitions and games organized by UEFA. They do not separate “European or non-European players”, as the only requirement by UEFA is that every player is part of his home country federation. On the other hand, we have, for example, the Premier League. As we know, the UK owns the richest football club in the world, and they could buy any player they want. For that reason (and others, of course), the UK have strict requirements for players who want to play in Britain. Also, if we see the issue from the other point of view, we have British players who are currently working and living in European countries. Patrick Roberts is a good example. 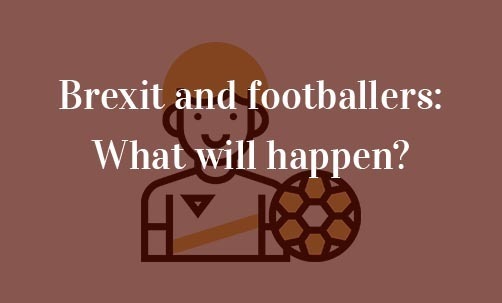 If we finally have a Brexit deal that leaves the UK out of the UE, British football players will be considered as “non-European”, and the UK government would have to legislate about keeping or not British football players in the English federation. If we analyse the legal framework, we need to talk about the European Regulation 492/2011 on freedom of movement for workers within the union. If the player is from any Eu membership, we can apply this European Regulation. But, if the player is not from a European country, we need to find the answer in the local legal framework where the player is working and living. In Spain, for example, we have the Law 4/2000, 11th January, about foreigners’ rights and liberties in Spain. The foreign player would need the administration’s authority in order to live and work in Spain. I cannot imagine very conservative measures adopted by politicians in that way. So, I hope that fields like employment and social affairs or transport will keep the freedom they have been holding until today, as a European Union country. According to the current law, if a British citizen would like to have Spanish citizenship, he/she would have to waive his right to have the British citizenship. We will need to wait if UK propose any law in order to afford the double citizenship during the transition time.